The first, short-lived, Franciscan mission for the Adais was built in 1717 roughly two miles to the southwest of the second mission, which was established in 1721. The second mission was built on a hill across a small creek from the presidio. The first mission was called San Miguel de Linares de los Adaes, and the second mission was called San Miguel de Cuellar de los Adaes, reflecting a change in the viceroy of New Spain. Contemporary accounts suggest that the Adais did not live at the mission, but were baptized and possibly buried there. Many of the baptisms of the Adais were in articulo mortis, or at the hour of death. It is known that several priests died and were buried at Mission San Miguel de Cuellar de los Adaes. Even though the mission was not successful in establishing a resident Adais Indian population, the priests at the mission served the local community for the whole span of the site's occupation. The priests at Los Adaes served both the presidio as well as the troops and settlers at Fort St. Jean Baptiste at Natchitoches during the early years. Urrutia's map depicts two large structures, one labeled the Church and the other the Priests' House. These structures form an L-shape with projecting fences enclosing a rectangular area within which is also a rather formally laid out mission garden. The garden appears to have a circular central plot with four flanking perimeter plots divided by NW-SE and NE-SW pathways. Outside the mission compound are two nearby houses. The hill upon which Mission Adaes stood has seen very little archeological exploration. 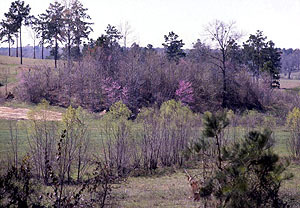 Mission Hill was the focus of a 1986 Northwestern State University archeological field school directed by Pete Gregory. Nine test pits and four shovel tests were excavated. Two units placed within what was thought to be the main mission building found structural evidence and exposed a linear stain suspected of being a burial, which was not excavated. A test pit also probed the edge of a depression not far to the east of the mission compound that might have been a well. This feature is not shown on the Urrutia map. 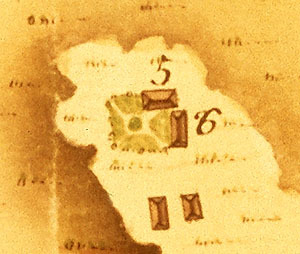 Mission Hill as depicted on the Urrutia map. Structure 5 is the mission church and structure 6 is the priests' residence, flanked by a formal garden . Mission Hill in the early spring when redbud trees are blooming. View from presidio area. Low-lying "plains" between Mission Hill (to left) and presidio (to right). In this 1986 photo, the "spring-fed branch" is visible as a slight depression darkened by grass killed by standing water after rains.